Deadly Catch by E. Michael Helms, a Mysterious Review. Review: Mac McClellan is a twenty-four year Marine Corp veteran who was married, divorced and has two kids in college. He has come to Florida's panhandle for a vacation, to relax, maybe make some plans for his future, but right now all he wants to do is settle in and do some serious fishing. He rents a boat, receives a map and instructions where the fish are biting, and isn't in the spot very long when he hooks a big one. Or, so he thinks. 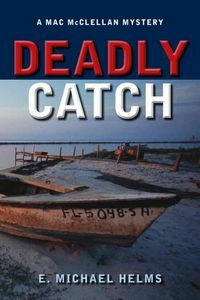 When he brings it to the surface the big fish turns out to be a badly decomposed body of a woman, in Deadly Catch, the first mystery in this series by E. Michael Helms. Mac notifies the sheriff, Bo Pikron, of his find. But from the beginning, Bo and Mac do not see eye to eye. When Mac tries to explain how he hooked the body and not a fish, the sheriff looks at him like Mac had something to do with the corpse. More, that is, than just accidently hooking it to his line, especially when Mac's penknife is found near the body. Then, when his rental boat is being examined, a package of rare marijuana is found tucked behind one of the seats. Bo tells Mac to stay in the area until he decides it is okay for him to leave. It doesn't take Mac long to realize that he is being set up to take the fall. Mac knows he has become the prime suspect in a murder investigation, with a side charge of drug trafficking. With Bo and Mac at odds, Mac knows also that Bo will not go out of his way to clear Mac's name as a suspect. Deadly Catch is an enjoyable mystery, one that gets more complicated as the story progresses. It turns out the dead woman is Bo Pikron's niece, Maddie. And soon thereafter Maddie's fiancé turns up dead, too, giving Bo all the more incentive to close the case with the most viable suspect in hand, i.e. Mac. Mac enlists the aid of a new friend, Kate Bell, who works at the local marina and together they learn that the charm of small town life on the coast of Florida masks some very serious crimes and hides those that commit them. Strong characters and an interesting setting make for a most satisfying read. Special thanks to guest reviewer Betty of The Betz Review for contributing her review of Deadly Catch. Acknowledgment: Seventh Street Books provided a copy of Deadly Catch for this review.